Let me congratulate everyone on International Women’s Day. Congratulations to you, all the women of the world, and the freedom loving women of Iran. Congratulations for steadfastly adhering to the cause of equality. Congratulations to the women of the world because their sisters in Iran led the protests this year against the mullahs’ fundamentalist and misogynist regime. This year, International Women’s Day is a day to be proud of, celebrate and admire because the women of Iran played their role at the forefront of the fight against fundamentalism, the enemy of women the world over. I must also salute our sisters around the world who resisted last year and stood up to tyranny, fundamentalism and violence. I would like to salute the women of Syria, in particular, who have kept the banner of hope aloft amidst the ruins of a country with 10 million homeless and 500,000 victims. And finally, on the answer to this question: What is behind our belief in the role of Iranian women? One of the most remarkable aspects of the uprisings was that women and youth had a pivotal role in them. Which is why one of the symbols of the recent uprising in Iran is the picture of a young woman passing through tear gas smoke with her fist raised. One of the chants was “Reformists, hardliners, the game is over.” This slogan was first chanted by young women and men, university students protesting in Tehran. The protesters also addressed the mullahs, chanting yet another important slogan: “Be afraid, we are all together.” This was initiated during a gathering outside Evin Prison, where women played an active role. Yes, the mullahs should be afraid, because we are all together. Khamenei has declared, “Women’s equality with men is one of those Western notions that are totally wrong.” And Iranian women gave him a decisive response. One courageous woman stood at arm’s length from the guards and security forces and shouted in their faces, “Death to Khamenei.” Nobody knows her name, but in that moment, her name was Iran. The regime thus confessed that the ringleaders encouraging the uprising were women. And I reiterate that the ringleaders for regime change in Iran are also the arisen women of Iran and freedom fighters. Women did not take to the streets to demand anything from the regime; they want to eliminate the clerical regime. Women have not risen up to demand only their own freedom; they have risen up to liberate the entire nation. This reality is the focus of the second part of my speech. Likewise, we tell the mullahs, when tens of thousands of Iranian women have been tortured and executed, when you have taken away their most basic rights, then the Iranian woman has the right to overthrow the clerical regime. And this right will certainly be upheld. Regime change is the right of Iranian woman. At the same time, it is her only way to achieve freedom and equality. As attested by the experience of the past 39 years, this regime has left no other method or means. Did the women of Iran gain anything from the game played by the so-called reformists and moderates? Never. Did the efforts to make slight reforms in the regime’s discriminatory laws benefit them at all? Never. Didn’t the number of misogynistic laws increase every year? Did women not lose more and more job opportunities with every passing year? Didn’t women become more unemployed, isolated and humiliated every year? As a result of these policies, most of Iranian society, particularly women, have become poorer and poorer with every passing day. Look at the condition of our society. Sale of kidneys, sale of infants, marriage of girl children, sexual assaults, verbal abuse and humiliation of women. Indeed, our nation is heartbroken and devastated by such oppression and injustice against women. The next issue is why the mullahs have deprived women of their most basic rights. The ruling mullahs claim that this is in accordance with the instructions of Islam. Faith is based on free choice and free will. The Quran stipulates, “There is no compulsion in religion.” Therefore, anything that is forcibly imposed on people is against genuine Islam, whether it is imposed religion or the veil. Mandatory veiling is against Islam and is only meant to enchain women, facilitating a general social clampdown. Iranian women realized that was their objective from the onset. Which is why the Mojahedin women participated in the protest march against the compulsory veil in March 1979, although they wore headscarves. From day one, imposing the veil on women was a means of repression and obstructing women’s way forward, and nothing else. Khomeini began his ominous rule on February 11, 1979. Fifteen days later, only 15 days, on February 25, he revoked the law on the protection of family. On February 28, he extended gender discrimination against women to the sports arena. On March 4, he granted men the unilateral right to divorce. On March 6, he revoked the law on women’s social services. On March 7, he imposed the compulsory veil on female employees. The person in charge of implementing this in the Army’s offices was Rouhani, the current president of the clerical regime. The 39-year history of this regime is a history of suppression of Iranian women. And now the women of Iran want to turn this dark page of Iran’s history with their own rising. And that explains why Iran’s uprising is not only for the overthrow of a political regime, but is also a revolt against religious fundamentalism. This is a new dawn. A hopeful dawn not only for the people of Iran, but for all the peoples of the region and the world, because the fundamentalism born with the rule of religious tyranny in Iran, died in the uprisings of 2017 and 2018. I am addressing the brave women who actively participated in the protests. The present circumstances provide the potential for continuing the protests. And the message for you, the arisen women of Iran, is that you should take this responsibility of furthering the uprising onto your shoulders. This responsibility is twofold: First, shattering the wall of fear and doubt, and second, organizing the protests. The protest gatherings of recent months and their climax in the eruption of the uprising once again showed that you brave women have been able to change the situation at crucial moments and expand the protests. Your role at this time is significant. Your specific responsibility is shattering the atmosphere of fear, repression and skepticism. Your role is to revive hope and courage in people and reinforce the power of youth in confronting suppression. When the Revolutionary Guards charge to arrest a youth, you should incite everyone who is standing paralyzed with fear and doubt to move, cry out and surround the agents. You can create a protest and an uprising out of a confrontation over an arrest. After the anti-monarchic revolution, from 1979 until 1981, the generation of young men and women students in high schools and universities stood firm against the attacks of club wielders and revolutionary guards and were fearless and brave in the battle for freedom. Your Mojahed sisters in Ashraf and Liberty persevered with that same spirit. They were at the forefront and time and again repelled the enemy who was armed to the teeth. So, when the regime’s mercenaries attack, you must endeavor with all your power to launch a counter attack, defeat the agents and compel them to retreat. Step up the protests against the arrests of protestors. And accompany the families of prisoners and support them. My dear sisters, you can crush the wall of fear, disbelief and despair. I have repeatedly seen you walk in the demonstrations with your arms locked together. You need to promote this. These closed ranks can and must establish freedom and equality. But your second duty, the duty of women protesters, is to organize. The uprising in January showed that organization is a prerequisite to advancement. So you must try to organize your sisters. Teach your countrywomen in all cities to set up 1,000 bastions of rebellion. Teach them to form councils of resistance. Tell the mothers that 39 years of agony is enough. Now, they should form the Mothers’ Resistance Council to continue the uprising. Tell the women heads of household that there is an opening to genuine hope that can be unlocked only by your hands. Unemployed and laid off women can undertake a major task by forming their councils of resistance. Forming resistance councils and bastions of rebellion is the way to continue the uprisings until final victory: the resistance councils of teachers, retirees, women employees, blue-color workers, high school and university students; the resistance councils of teachers, nurses, mothers of the executed, and mothers of the imprisoned. I would like to stress that to expand the uprising and to overthrow the clerical dictatorship, we need to create hundreds and thousands of opportunities, and this is something that all of you free women of Iran can do. Addressing the freedom-loving men of Iran, especially the youth, I would like to say that you need to couple your fury and hatred of the clerical regime with resistance against its misogyny. The mullahs’ policy is suppressing women and compelling men to be passive and surrender. You should crush this policy all together. Your brothers in the ranks of the PMOI and the Iranian Resistance have paved the way and advanced in struggle and in thinking by respecting women’s equality. The same is true for you. To defend your own human identity, and to defend the dignity of Iranian woman, rise up and fight against the mullahs and their repression. Never remain silent when a woman is attacked. Never give in, and never stand by and watch. Resist against suppression and humiliation of women and youths and in this way distance yourself from the backward and fundamentalist ideology of the mullahs. Multiply your strength and human dignity a hundred times over. Yes, you men can also demonstrate your human identity and multiply it a hundred times over in this uprising despite the clerical regime’s suppression, medieval culture and religious despotic rule. Nobody granted the woman of Iran the status she holds today. She has built it through her own suffering and sacrifice and with her determination to achieve freedom in the course of her struggle against two dictatorships under a qualified leadership. On the night of June 20, 1981, Khomeini ordered the executions of 12 Mojahed girls only for participating in the peaceful June 20 demonstration. Most of them were less than 18 years old. When executed, however, they had not even revealed their names. In subsequent years, tens of thousands of Mojahed and other combatant women were tortured or executed. Indeed, why did Khomeini use the torture chambers known as residential units, against women prisoners? Why were they imprisoned in cages and coffins? Because their torturers had been repeatedly defeated by their resistance. 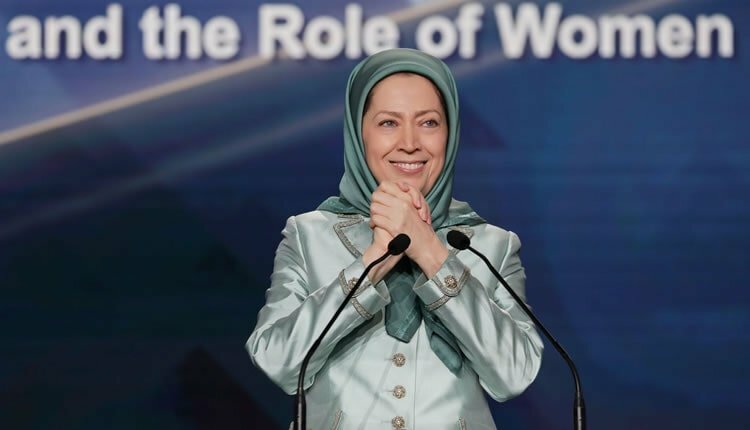 The years 1981 to 1987 – with the resistance of Mojahed and combatant prisoners, particularly women – are indeed among the most glorious phases of the history of the Iranian resistance for freedom. In the early years of Khomeini’s rule, Mojahed and combatant girls created a formidable barrier against him. In the next step, there were heroines like Tarhereh Eskandar Nejad and Akram Khorasani, vanguards of the confrontations with Revolutionary Guards in the streets of Tehran. In the PMOI and the National Liberation Army, women held the highest positions of command. In the battles of the Eternal Light Operation, women’s high and aggressive spirits terrified the enemy. Still, after three decades, the regime recalls them with fear. Tahereh Tolou was among the commanders of that battle. The Revolutionary Guards were so spiteful of her, that they stabbed her in the heart and hanged her body from atop a cliff overlooking the Charzebar strait in Kermanshah. Then we see over 14 years of perseverance by Iranian women in Ashraf and Liberty. They protected Iran’s bastion of freedom under a harsh and lengthy blockade. And now, we are observing the same courage of women in the protests or in the resistance, and in the hunger strike by women political prisoners. Iranian society will never forget women like Fatemeh Amini, Marzieh Oskouii, Azam Rouhi Ahangaran and Ashraf Rajavi, who opened the way for the 1979 Revolution with their determination and sacrifice. Hail to all of them. It is with these assets that we say the fundamentalists cannot prevent the victory of Iranian women. And now I would like to address the equality movement and my sisters from around the world. Fortunately, there are some of my dear sisters here from Asia, Europe, the US, Africa, Canada, and Australia. I would like to reiterate that supporting the struggle against fundamentalism is the greatest project of our time for advocates of women’s rights. Since the heart of fundamentalism beats in Iran and under the rule of the mullahs, supporting the Iranian people’s uprising for the overthrow of the regime is doubly important. I am confident that the women of the world will undertake their historic responsibility. When women continue to suffer from oppression, poverty, discrimination, and violence while making up half of the world’s population, any resistance against oppression and injustice is an achievement for all women. Now, I would like to tell you, women active in the equality movement: The uprising of your sisters in Iran against the mullahs’ misogynist regime, is an advancement for all humanity. Any step you take for them, any activity in defense of the arrested women, any effort to expose the torture of prisoners, and anything you do to compel your governments to sever relations with the clerical regime, is going to be very effective. In the present circumstances, we demand the immediate release of the prisoners of the uprising, freedom of speech and assembly, and abolition of women’s suppression and the compulsory veil. To realize these demands, we need the support of each and every one of you. The day, when Iranian women destroy the roots of fundamentalism in Iran, freedom and equality will have made a leap forward all across the world. And that day is not far.